The Paynesville Landfill, properly covered and officially closed in 1996, continues to be monitored by the Minnesota Pollution Control Agency. Out of sight and out of mind for most local residents, the Paynesville Landfill has not been forgotten. Ten years ago, piles of garbage were rearranged and monitoring systems were put in place as the Paynesville Landfill was prepared for closure. Today, the Minnesota Pollution Control Agency (MPCA) continues to monitor the site to ensure the safety of the surrounding area. Tests completed under the direction of the MPCA - which is now responsible for the landfill - have shown decreasing contaminant levels over the past decade, none of which have exceeded safety thresholds "for about three years," said Ingrid Verhagen, a hydrogeologist with the MPCA. The landfill began operating under its first permit in 1976, though that it had been a dumping ground before that. Waste was accepted at the landfill until May 1989. John Paulson of the Minnesota Valley Testing Lab conducts a sampling test at the Paynesville Landfill this month. Ten years after the landfill was closed, the Minnesota Pollution Control Agency continues to monitor the site, with contamination levels appearing to continue to decline. In 1996, the landfill was properly covered and officially closed. Originally, the permit was for 68 acres with a 17-acre area for fill, where 870,000 cubic yards of waste were to be deposited. Additionally, an unpermitted wetland area owned by a neighbor was filled with between 150,000 and 250,000 cubic yards of waste. "A history of violations" troubled the landfill when it was open, according to John Moeger, MPCA project leader for the Paynesville Landfill. "Operators failed to follow their plans and specifications," he explained. After controversy about the landfill's permit and the detection of contamination in 1989, the landfill stopped accepting waste that year. However, it was not closed correctly until seven years later. Ownership of the landfill was taken over by the state in the mid-1990s, and it is now in the closed landfill program, which will monitor the site as long as the program exists, said Moeger. Groundwater is sampled regularly at the site, he noted, and the wells are tested twice per year, as determined necessary by Verhagen. In August, samplers from the Minnesota Valley Testing Lab, located in New Ulm, Minn., were in Paynesville taking samples on the site. Sampling is done at different times each year to detect fluctuations caused by changes in seasons and in rainfall. Results are not yet available from the latest testing, but the last sampling - in April - showed contamination in only one well. That well had minimal contamination and did not exceed safe levels. Verhagen commented, "We've been pretty pleased that the cover has been doing what it should do out there, and that the contamination has shown a decreasing trend." A cover constructed over the landfill in 1996 included a foot of compacted buffer soils, a synthetic liner, and two feet of cover soils. A gas venting system and surface water controls - funneling surface water to a pond and drainage ditch - were also installed. The goal of the system is to control water flow, because, as Moeger said, "If you keep the water out of the waste, you're going to prevent...ultimately having the water leach through the waste and reaching groundwater." He compared leaching to the operation of a coffeemaker, with the water going through the waste like water runs through coffee, picking up the contaminants like the water in a coffee pot picks up flavoring. Only minor erosion and settling of soil had been observed by the MPCA when it published its latest report on the landfill in 2004, which means the cover on the main portion of the landfill is in good shape to prevent that leaching. Moeger said that "the current condition hasn't really appreciably changed," so another report has not been published since. In fall 2004, investigations of the unpermitted portion of the landfill revealed that 5.2 acres of waste previously thought to have a two-foot layer of compacted clay had deficient cover. In that area, the cover varied from the expected two feet to no compacted clay at all. There are plans to correct this, though Moeger noted that the MPCA is waiting for money to take that step, saying that "it's funding that has caused some problems." However, it is "not an immediate health or environmental concern," he emphasized. When last checked in 2004, 13 of 17 acres were covered with the equivalent of four feet of soils, and the venting system was functioning. Four gas probes showed no methane or other gases of concern. 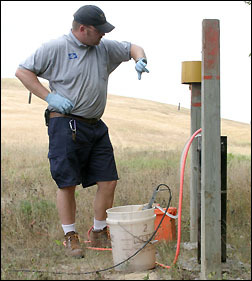 Fourteen wells are used to sample for volatile organic compounds (VOCs), which have been detected at some level in all wells in the downslope area from the landfill. Some wells are at the water table and some are deeper, and 8-11 wells are sampled each time testing is done. When testing was done this month, the water level was tested in all 14 of the wells, sampling was done of 11 wells, and the four gas wells were checked. Residential wells in the area have also been sampled, most recently in June of last year, when four wells north of the site, on Co. Rd. 34, were tested. No contamination was discovered in them, Verhagen said. Testing is done for 68 different VOCs, plus chloride, which is a general indicator of contamination but can have other causes, like road salt getting into the ground. One well in particular registers total VOC concentrations at a higher level and with more fluctuations than the other wells, but those concentrations are still declining. Verhagen said that there have been "a few VOCs here and there," but nothing of concern, as the findings are minimal and inconsistent. One new well was added in 2004 to test the quality of groundwater on the southeast side of the landfill. Passive gas extraction at the landfill uses 13 gas vents, all of which are functioning properly, according to the 2004 report. Four gas probes allow sampling for methane. The vents release gases into the air, where they are not harmful, according to Moeger. Otherwise, the gases, generated by decomposition of garbage, could travel within the ground, killing crops and filling buildings, where they could be explosive. A buffer zone also exists around the landfill, and it is sufficient on all sides except the east. There is no potentially harmful activity being done in the unbuffered area to the east, though the MPCA would like to see an easement put on that area, according to Moeger. Moeger, Verhagen, and their colleagues in the closed landfill program have been monitoring the Paynesville Landfill since 2000. It's a state-funded program, with 108 landfills currently, which accepts landfills closed before a specified year and works to clean them up. According to Moeger, the program takes landfills out of the superfund program - where the polluter pays - and provides state funding to help clean and monitor them. In that way, messy litigation is prevented, and landfills are often cleaned more quickly, though he added that it does "not let owners off entirely." Moeger mentioned that the closed landfill program needs to "prioritize all of these landfills in terms of their threat to health or the environment," and now that many larger, more serious problems have been remedied, less threatening landfills like the Paynesville Landfill can be addressed. Last time it was scored, the program classified it as a "D" in a rating system from "A" to "D." In the mid-1990s, the landfill was given an "A" classification, which denotes projects with the greatest immediate threat. The current rating of "D" means that there is no immediate threat of contamination, contaminant levels are stable or decreasing, and no methane gas has been detected beyond the land where waste is buried. Since the area of deficient cover was discovered after that, the MPCA is considering rescoring the landfill in order to move it up in the priority list.